Caesarea Maritima was a city and harbor built on the ruins of Straton’s Tower by Herod the Great about 25–13 BCE. It’s a very popular site, the archaeological park lies on the Mediterranean coast of Israel about halfway between the cities of Tel Aviv and Haifa. The city of Caesarea was described in detail by the 1st century Roman Jewish historian Josephus. The city became the seat of the Roman praefecti soon after its founding. In 1961 Italian archaeologists excavating the theater found a stone inscription with the name of Pontius Pilate, according to the New Testament the Roman Governor responsible for ordering that Jesus be put to death, the first archaeological evidence that Pilate existed. While visiting the Herodian, Roman, Byzantine and Crusader ruins of Caesarea make sure to see the nearby aqueduct and Bird mosaic, a large rectangular mosaic ‘rug’ on the floor of an extravagant palace first uncovered in 1950 but only conserved and viewable by the public in 2004. It’s a tapestry of the land of Israel and includes fruit trees and animals native to Israel (lion, tiger, bear, wild boar, ibex, dog, elephant, deer and bull) bordering 120 round medallions, each of which contains a different bird. The owner of the palace is unknown but was obviously extremely wealthy. Built in the sixth century, the palace included a hall with the mosaic floor, columns, an open roofed yard and a second floor. The findings indicate an exceptionally developed water and drainage system that included inclined floors, water canals and recessed wells. This entry was posted in Archaeology, Art, Mosaics, Nature and tagged animals, birds, geometric, mosaic floor, mosaics on November 11, 2010 by Shmuel Browns. In 1950, my father, an ancient history enthusiast, was walking on the beach at Caesarea. (He was with the British Embassy in Tel Aviv) There had been a storm the night before and as he was walking along the sand, he saw -right there-an amazingly beautiful,well-preserved mosaic.Assuming that its existence was well-known,he didn’t report it.A few weeks later, he read in the newspaper that it had been found by someone else! 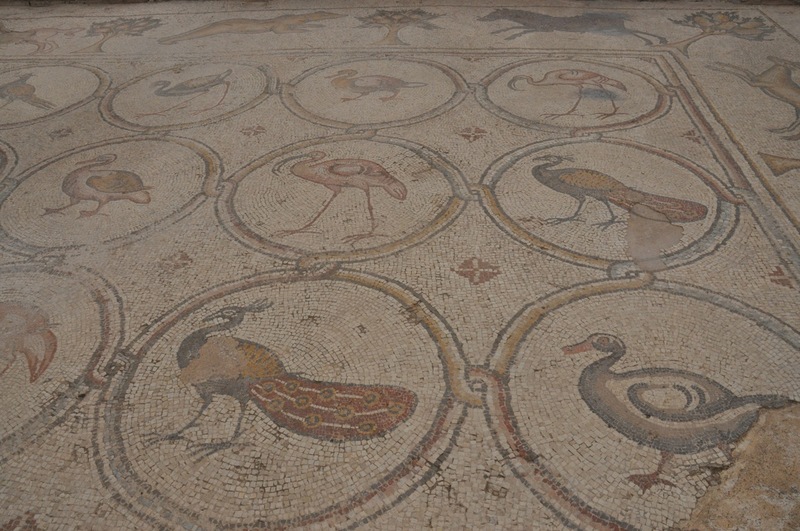 I visited Caesarea last week, but not the villa with the bird mosaic, I’d love to know which mosaic it was he found.